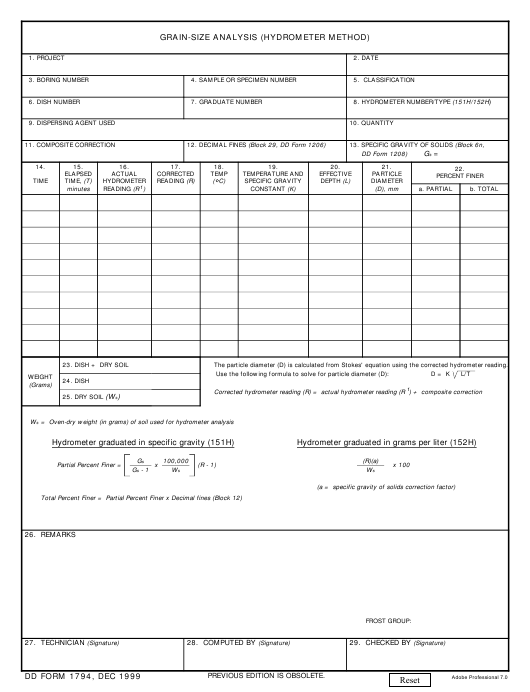 DD Form 1794 - also known as the "Grain-size Analysis (hydrometer Method)" - is a United States Military form issued by the Department of Defense. The form - often incorrectly referred to as the DA form 1794 - was last revised on December 1, 1999. Download an up-to-date fillable PDF version of the DD 1794 below or request a copy through the chain of command. The particle diameter (D) is calculated from Stokes' equation using the corrected hydrometer reading.